This is the most complete and striking structure at Mitla. 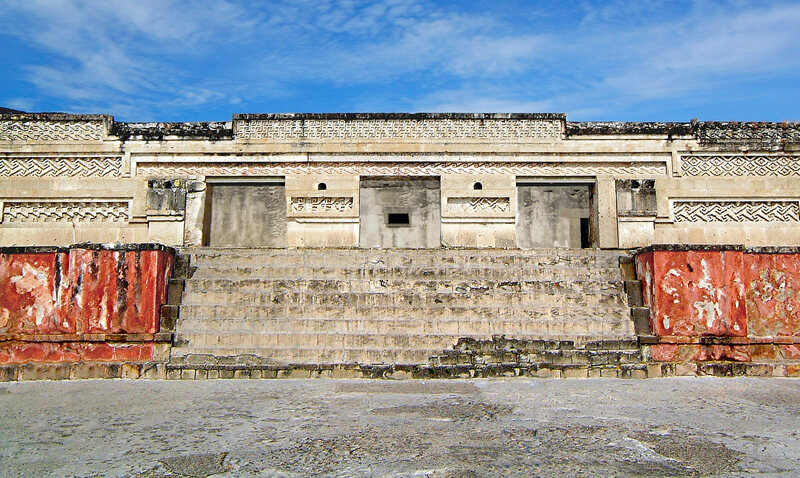 Known officially as Building 7, it is more commonly known as The Palace Of Pezelao, named after a Ruler of Mitla in around 900AD. However, it is quite likely that this was the legendary entrance to the Temple of the Underworld, which brought Mitla to prominence. The Palace sits on the north side of the Columns Group, and behind this facade is the Hall of Columns and beyond that the Patio of the Mosaics. The red paint, known as carmine, was common across Mesoamerica and is produced by extracting carminic acid from the cochineal insect which lives on cacti.